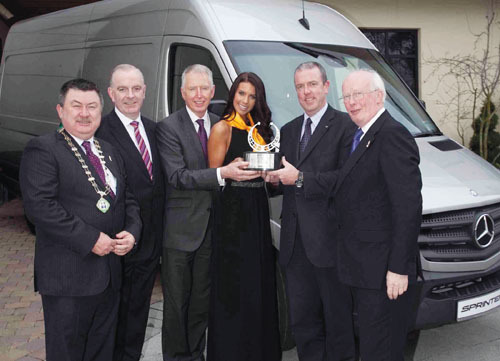 The Mercedes-Benz Sprinter has been voted Continental Irish Van of the Year 2014 by the special IMWA van jury. Pictured (L to R): Gerry Murphy, chairman, IMWA; Tom Dennigan, Continental Tyres Ireland; Stephen Byrne, chief executive, Mercedes-Benz; model Adrienne Murphy; Fergus Conheady, commercial vehicles sales manager, Mercedes-Benz; and Brian Byrne, chairman, IMWA Van of the Year jury. The Mercedes-Benz Sprinter has been voted the Continental Irish Van of the Year 2014 by the special nine man member van jury of the Irish Motoring Writers Association (IMWA ). The announcement was made at an awards ceremony in Dublin last week in front of the leading figures from the Irish motor industry. The Sprinter was adjudged the winner following the IMWA van jury vote which was based on a range of criteria including safety, driving quality, reliability, versatility, and value for money. These awards last year provided a clean sweep for Ford. The Continental Irish Van of the Year title was awarded to the Ford Transit Custom. The Car-Derived Van and Commercial SUV category awards went to the Ford Fiesta Van and the Ford Kuga Van respectively.